It’s a new season. The failure of Luis Severino’s change-up has been cited as a key reason for last year’s dismal starting performance. Sevy had bulked up during the off-season, and the end result was throwing his pitches harder, including the change-up. Post-game comments by Gary Sanchez yesterday cited the importance of keeping the change-up low. With work this off-season to restore his previous touch with the pitch, the belief is that he’ll return to being the effective three-pitch starter that he had been in late 2015. 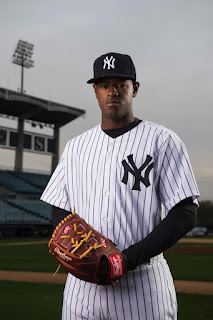 An effective change-up, to go with his slider and fastball, should hopefully put Severino in the driver’s seat for the #4 slot in the starting rotation. Here’s hoping that his off-season work with Pedro Martinez erases all memories of last season’s 0-8 mark as a starter. I would love nothing more than Severino to show he can be a key cog in the rotation. Facing the great pitching staffs in Toronto and Boston, the Yankees will need five guys who can keep the team in games before the hand-off to the bullpen. Another "O-fer" performance by any starting pitcher would be deadly to the team’s chances for success. After facing the Blue Jays yesterday, the Toronto hitters will get another look at Severino on Friday in Dunedin, FL. It will be interesting to see if he can be as effective the second time around and prove that he is on the right path for sustained success in the new year. I’ve participated in a few Fantasy Baseball drafts and so far, it seems that catcher Gary Sanchez is often taken as the first catcher (ahead of Buster Posey of the San Francisco Giants). He is generally the first Yankee to come off the board even though Aroldis Chapman and Masahiro Tanaka tend to be higher on most Top 100 lists. Sanchez is clearly getting the love right now from baseball fans everywhere. When I turned on Sports Radio this morning, I was flooded with references to the famed Pine Tar Incident in July 1983 involving George Brett, Billy Martin and a questionable bat thanks to the faux pas that occurred last night at The Oscars when it was incorrectly announced that La La Land had won Best Picture. The image of George Brett, who had just hit a go-ahead two run home run, running and screaming after being called out following an appeal by Yankees manager Billy Martin raced across my mind. Moonlight was subsequently named winner of Best Picture after La La Land acceptance speeches had already begun. But if the Pine Tar Incident was the true analogy for what happened at The Oscars, then La La Land will still win Best Picture in a few days when they replay the competition considering that the Kansas City Royals ultimately won the Pine Tar Game when it was replayed from the point Brett had hit the home run. Neither team scored again so the Royals’ 5-4 lead held up for the win. Regardless, congratulations to Moonlight for its victory. That’s a decision that will stand the test of time (unlike the Pine Tar Incident). Yesterday was a sad day in Yankees history. The legendary Babe Ruth was released by the Yankees on February 26, 1935 so that he could sign with the National League’s Boston Braves. It’s sad that Babe Ruth never realized his dream of managing. It was that dream that led to the friction with the Yankees at the end of his Yankees career as he openly wanted manager Joe McCarthy’s job.